oh defintitly. im going to sweetwater in ft wayne to try some. I can't imagine paying more than three or four hundred on a guitar or bass. I'm just way too cheap. I'm perfectly content with my beat-up Austin 4 string ($125). But I've been toying with the idea of getting a second bass and have been looking at the Ibanez GSR200 ($180 or so). Been reading solid reviews of that one. I was also looking at the Ibanez GSR200. I tried it out at guitar center and liked what I heard. Fun to play. I used to think this way too. 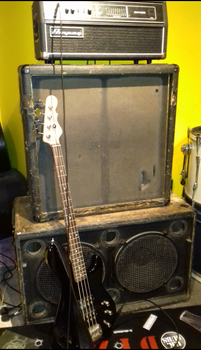 I know you can get some good tones out of cheap bases, but I also know that a cheap bass set up right can play just as well as an expensive bass. But the old adage of “you get what you pay for” seems to ring true in just about everything. Everything else I have pales in comparison to my American Fender Jazz. It's just a better instrument. I make sure to play everything I have weekly (currently the swarm is just 5, with the refinish project stalled again). But I always end up coming back to the Fender. If I have 5 minutes to play, it's on the Fender. If I'm going to practice up for a gig/church, it's the Fender. It's just more enjoyable to play it. And when anyone else plays it they comment about how sweet it is to play. Yeah, it cost 2x what a MIM would have, but I feel I'm getting my money's worth out of it.